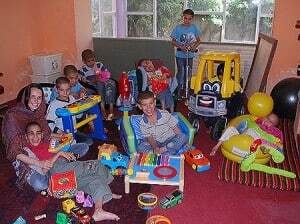 It took lots of effort but there is comfort and joy at last for some very special children. In true round the world style, a plea was sent to John and Lorna by friends of Linda’s. Could they help provide beds and toys for children with special needs? David and Angharad James, who are doing their own work here in Afghanistan with Mountain Unity – supporting trekking in the Wakhan province, starting up a candle making business that will employ women, running a children’s play center – became involved with these children who live in a group home with caretakers. Children with their new toys. The children are orphans, or their families simply cannot take care of their special needs. Some are crippled with cerebral palsy, a few have autism. 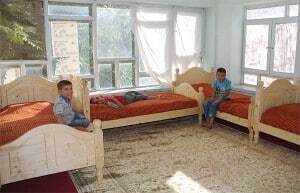 Two generous Afghan patrons provide funds for food and rent but there are no social workers, no physical therapists, and certainly no small comforts of life. Until recently, the children slept on thin mats on a cold, hard floor. Caretakers change frequently. It is hard work lifting the children. They spent their time on the floor, even being fed lying flat on their back. They are thin. Feeding a disabled child well takes time and money. Play time, entertainment, comfort – there is lots of wishful thinking but not much hope of making it come true. What changed recently? Karen, a social worker from Children in Crisis, and Angharad are determined to make things better for these kids. Help in the form of high protein supplement bars was provided by UNICEF. The staff had to be convinced that the children could be taught how to chew, that it was important for them to sit up or be propped up on pillows when eating. Eggs, fruit, yoghurt – all hallmarks of good nutrition – were all strange to the children. You cannot just educate the staff about the importance of good nutrition; the children have to learn how to eat and how to like these foods as well. Two of the boys with their new beds. Now for the ultimate luxury: the Linda Norgrove Foundation were asked if they could provide real beds and toys. What heaven, to rest their bodies on a real spring mattress. What heaven for the staff not to have to bend and lift the children from the floor. Winter cold seeping into their bodies from the floor will be a thing of the past. What excitement to handle brightly coloured toys that have buttons to push that make music. What a thrill to roll a truck or a car in front of you and suddenly find your mind somewhere else, travelling to places near or far, real or imagined. Watch the video of Angharad’s visit to the children’s home. “A little boy grabs my hand and we dash up the stairs, he runs and bounces on one of the new beds. Before, he was sleeping on a thin mat on the floor and had no personal space of his own. I laugh and joke about how bouncy the bed is and he is grinning from ear to ear. Abdulla, who has cerebral palsy, joins us along with one of the other boys. Abdulla likes to be the centre of everything and is keen to be brought upstairs. He has a smile that just lights up the room and he lies on his bed and nods with a big grin when I ask him in Dari if he likes his new bed. Marianne Parente is helping the Foundation to identify and implement its grant projects in Afghanistan. This is so wonderful! Brought tears to my eyes. Nothing better than to see children smile. Can we ship stuff to you for the children or is it too difficult to do that?